It’s a week before Christmas. Our last week in Advent. I wonder where people are in the Christmas shopping. Is the holiday meal planned out? Travel plans confirmed? Christmas services cancelled? (Yes, you read that correctly). But first we have to deal with Mary. The bible reading for this fourth Sunday in Advent comes from my favorite gospel, Luke. Luke’s whole message is for ordinary people just like you and me. Rather, God’s whole message and God’s whole purpose relies on ordinary people embracing it and living it out in their daily lives. Superheroes are not part of God’s strategy for the world. Rather, it’s always been ordinary people in ordinary parts of the world with ordinary lives. 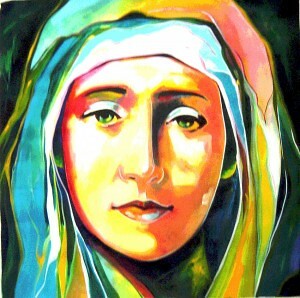 If Mary was anything, she was the epitome of ordinary. She was just another teenaged girl of marriageable age in an ordinary town in an ordinary country in the ordinary time in which she lived. In fact, it is all of the ordinariness of the Christmas story that makes it so extraordinary. How could a common girl give birth to a child that would fulfill God’s promise of an eternal dynasty to David and as God’s Son? How could this child that fulfilled these promises be born into such ordinary circumstances, grow up under such ordinary parents, and do such ordinary work as a carpenter? And when he does move into his ministry, it is ordinary people, fishermen, a tax collector, a community organizer, and the like that follow him. Mary praises God for the justice and grace, the love and peace that God is bringing into the world through her. Isn’t that just like God? To show up unexpectedly in the messiest of situations and intervene in human history? To grace an ordinary girl and use her for something extraordinary? To choose ordinary people as agents of change to make extraordinary things happen? The ordinary soul is the only soul who even interests God. Sunday’s bonus: Breath of Heaven by Amy Grant and sung by Eden’s Bridge.